In The Island of Excess Love, Pen has lost her parents. She’s lost her eye. But she has fought Kronen; she has won back her fragile friends and her beloved brother. Now Pen, Hex, Ash, Ez, and Venice are living in the pink house by the sea, getting by on hard work, companionship, and dreams. Until the day a foreboding ship appears in the harbor across from their home. As soon as the ship arrives, they all start having strange visions of destruction and violence. Trance-like, they head for the ship and their new battles begin.This companion to Love in the Time of Global Warming follows Pen as she searches for love among the ruins, this time using Virgil’s epic Aeneid as her guide. 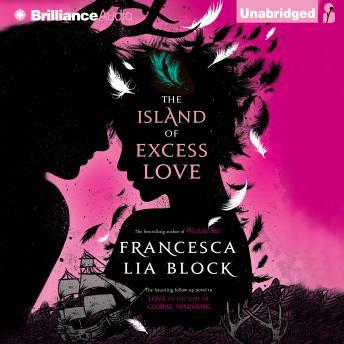 A powerful and stunning audiobook filled with Francesca Lia Block’s beautiful language and inspiring characters. I love Francesca Lia Blocks stories. They are so creative and wonderful. Fantasy mixed with real life, loaded with a bunch of what ifs. I wish this series wasn't over. I dying to know what would happen next!! I wish more of her books were on this site.